William A. Dyrness and Veli-Matti Kärkkäinen, eds. Global Dictionary of Theology (IVP 2008), 996 pp. Vinoth Ramachandra, Subverting Global Myths: Theology and the Public Issues Shaping Our World (IVP 2008), 296 pp. Douglas A. Hicks and Mark Valeri, eds. Global Neighbors: Christian Faith and Moral Obligation in Today’s Economy (Eerdmans 2008), 276 pp. For several years now, IVP has been raising the bar for theological and biblical reference works – most notably with their remarkable series of black dictionaries. 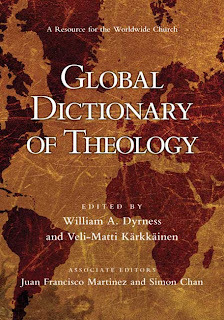 Their latest offering, the Global Dictionary of Theology, is another exemplary reference work and a first-rate resource for students and teachers of theology. The book provides an up-to-date picture of how theology is being practised today on every continent and in numerous different national and ethnic contexts. Generally speaking, the editors have avoided smaller entries, and have devoted the volume to extended, substantive articles on major themes. In many cases, there are multiple authors for a single entry, so that the volume represents some lively debate and discussion. For example, the entry on “Capitalism” (pp. 127-33) includes a critical section written by a Spanish theologian (and it’s good stuff too: “capitalism does not merely represent a structural sin, but the global and imperial configuration of the basic structures of Adamic sin…. This then means that all authentic proclamation of the gospel is always a direct challenge to capitalism”), coupled with a somewhat more sympathetic treatment written by an American. Again, the excellent entry on “Christology” (pp. 167-86) features an wide-ranging introductory section by Kärkkäinen, followed by an extended account of the new contextual christologies by J. Levison and P. Pope-Levison. And although most African nations are grouped together as “African theologies,” there are excellent separate entries on evangelical, Protestant and Catholic African theologies, as well as on traditional African religions. In addition to the many national and ethnic entries, one also finds fascinating perspectives on themes as diverse as aesthetics, human rights, healing and deliverance, music, missionary movements, theological education, theology of work, and relief and development. Of course, “global theology” is an unwieldy topic, and the book reflects some interesting methodological decisions about what counts as “global.” For example, the entry on “Australian theology” (written by a very promising young Pentecostal theologian) discusses the theological importance of Aboriginal history and spirituality in Australia, as well as the function of (mythical) Aussie identity-markers like “mateship” and “the fair go.” It may be true that “various scholars have sought to theologize … the broader metaphorical meanings” of such identity-markers – but such theologising would hardly represent the daily concerns of most practising Australian theologians; and this focus on the idiosyncratic features of Australian theology hardly gives the reader an impression of the broad landscape of theological work in this country, or of the main lines of division between the country’s dominant theological styles. Don’t misunderstand me: the entry on Australia is interesting and informative, and I’m drawing attention to it only because of my own familiarity with this particular “global” context. But I think the questions raised here are important methodological questions for any account of global theology. Even if such an account is motivated by postcolonial sensitivities and by a desire to move beyond the narrow dominance of European theologies, one might also ask whether a certain (more refined) imperialism is at work in the endeavour to isolate and analyse the most exotic and idiosyncratic features of a particular theological context. I once heard of a Karl Barth conference that was held in Germany several years ago. The conference organisers had invited a Japanese theologian to participate, but they were somewhat dismayed to find that their Japanese scholar had no interest in theologising his own national context – he was entirely preoccupied with the questions and problems of modern German thought! Presumably the conference organisers had expected their guest to provide a more exotic “oriental” perspective. The editors of this volume report a similar problem, where contributors had failed to provide adequately idiosyncratic accounts of their particular contexts: “A further challenge that was in some ways surprising was the number of scholars from the Global South who tended to do theology in the manner of their Northern teachers. Occasionally, entries drafted by theologians from Asia, Africa and Latin America did not differ significantly from entries that would have been written by their European or North American counterparts…. Who is going to do authentically Asian, African or Hispanic theology if not theologians from those particular locations?” (p. xi). Here, the norm of theological “authenticity” has apparently already been settled in advance; an African theologian who wants to talk about European intellectual problems is simply not African enough! These observations are intended more as broad methodological questions than as a critique of the Global Dictionary of Theology. On the whole, the volume is in fact exemplary in this respect: the editors have tried to avoid an imperialistic tyranny of the exotic, especially by representing not only liberal/progressive voices, but also evangelical, Pentecostal and conservative Catholic perspectives. For example, the entry on Korean theology rightly emphasises the central importance of Calvinist and Reformed traditions, so that a Princeton theologian like Sang Hyan Lee should be viewed as a major representative of contemporary Korean theology. The broader methodological questions which I’ve been raising are taken up very ably in Subverting Global Myths, by the Sri Lankan theologian Vinoth Ramachandra. The book offers a series of critical theological interventions in a range of contemporary public issues, such as terrorism, religious violence, human rights and multiculturalism. Underpinning the book is an analysis of the function of myth and idolatry in contemporary public life: “What frightens a people serves as a reliable guide to their idolatries. Idols are sustained by myths – public, large-scale narratives that engage our imaginations and shape the way we experience the world” (p. 12). The chapters on multiculturalism and postcolonialism are especially good; since it connects with my earlier remarks, let me just focus here on Ramachandra’s analysis of postcolonialism. “Asian theologies are taken to be theologies addressing what is called, in typical Orientalist fashion, the Asian context; and the latter is reduced to poverty, women’s empowerment and the presence of ancient world religions…. Western theologians feel free to write on such ‘Asian issues,’ but Asian theologians who address other issues within their churches (e.g. healing, ethnic fragmentation, ecclesiastical politics, responding to persecution) or global issues (e.g. postmodernism, genetic technology, evolutionism, the internet) tend to be marginalized…. Moreover, only if one were to espouse the typical Western secular liberal agenda … can one acquire the status of being a ‘progressive’ theologian. Hence the huge gulf between those who profess to speak for the Third World church and the Third World church itself” (pp. 255-56). Ramachandra’s incisive critique deserves sober reflection. His book is a serious and passionate piece of public theology, and it makes for gripping and compelling reading. that a free-market economy is not a morally neutral system; it is itself underpinned by a cluster of moral and theological assumptions. That’s not to say that the authors provide any deep critique of capitalist economy – their aim is to contribute to public debate, so the result is a very practical and pragmatic book about the complexity of moral decisions in a global economy. I suppose it is the book’s “public” and pragmatic tone that leaves me finally feeling unsatisfied with its proposals. For example, I scarcely feel that the theological critique runs deep enough when an essay on U2’s activism concludes: “Bono as celebrity leader makes a notable contribution that stands as a challenge to citizens to press our political leaders into doing their part” (p. 62); or when another author remarks: “If our government is failing us, it is because we are failing as citizens to shape a government that expresses these values” (p. 247). It seems to me that both these quotes point to a significant gap in the volume’s theological agenda: the absence of ecclesiology, of a Christian community whose own practices might open up an alternative economic space. Such a community would function not as a political lobby aiming to implement particular moral-economic “values”, but as a public witness to the economy of grace that has appeared in Jesus Christ and that is given in the eucharist. So on that note, I should end this long and meandering review by pointing you to still one more book – William Cavanaugh’s delightful work, Being Consumed: Economics and Christian Desire (Eerdmans, 2008). Although I think some of Cavanaugh’s practical suggestions are too simple, his book nevertheless models the best kind of response to our global free-market economy: not an attempt to lobby or influence existing political structures, but an exercise in theological imagination, in which the world and the church are re-imagined together under the light of the gospel.